Our new service 24/7 available in our agencies! 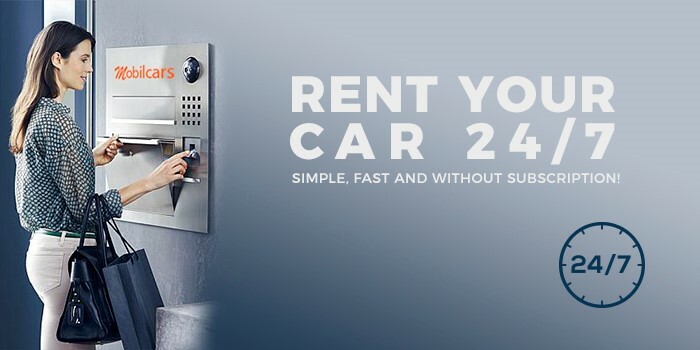 Rent a car 24/7 and self-service! This new service is here to make your life easier and is available in our Lausanne (Montbenon), Geneva train station and Yverdon-les-Bains agencies. Simple, fast, efficient & without subscription. In a few steps, you will be driving the car that fits your needs anytime time of any day! 1. Get in touch with us via email or phone. 2. Choose the kilometric package that you need with our colleague. 3. Send us a copy of your driving license and passport/ID. 4. Confirm the rental by paying for it with our colleague. 5. Get a special code and a procedure to follow that will give you the access to the car key. 6. See you at our Digibox to get the keys and the car. Enjoy your drive! Discover the best of car rentals, our new service Mobilcars 24/7 without subscription and available on all of our tourism cars, moving trucks from 2.5m3 to 6m3 and 7/8/9 seaters vans. If you need any more informations, get in touch with us by phone or via our request form.. The only agency with an office directly in Lausanne Train Station! From train to car in less than 6 minutes!